Russ Nicholson peeling apples, Arthur Rothstein, Shenandoah National Park, Virginia. In 1935, Arthur Rothstein, Stryker's student at Columbia and the first person he hired at the RA, headed to the Blue Ridge Mountains of Virginia for the Historical Section's inaugural assignment. It was not chance that brought Rothstein to the Virginia mountains. The inhabitants of the area, displaced 10 years earlier for the formation of Shenandoah National Park, proved a model for resettlement. That relocation effort represented just the type the Resettlement Agency hoped to complete--and gain support for--with the displaced farmers of the South and Midwest. Furthermore, the residents of the Blue Ridge Mountains comprised some of the poorest, least educated, and most famous of American regional groups. They were viewed as phenomananly old-fashioned. As historian Peter C. Stewart remarks "the impression persists that had Rip Van Winkle fallen asleep in early twentieth-century Virginia and awakened twenty, thirty, or even forty years later, the fictitious New Yorker would have found few changes" (Johnson 1). Indeed most of the people of the Blue Ridge Mountains had lived in relative seclusion since before the American Revolution. They used very old-fashioned tools and had very old-fashioned manners (Johnson 15-16). This unique group, of course, proved a particularly interesting study for Rothstein. The great majority of Rothstein's work falls into just the kind of preconceived categories Americans had placed the mountain folk into for two hundred years. He stressed their down-home appearance and the antiquated tools they employed. Portraits of their dilapidated shacks and out-dated farming equipment seemed to beg for government support. 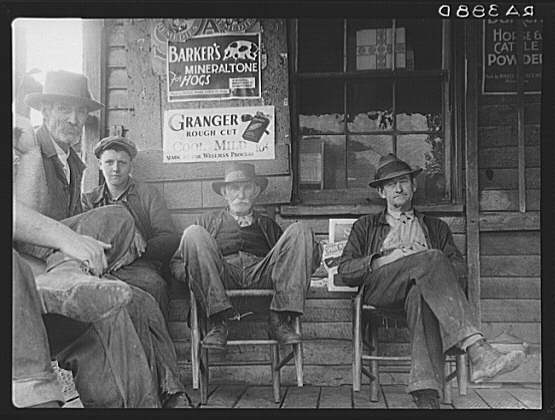 The pictures often seem almost removed from time, with the one at the top of the page featuring a group of primitive, rugged, and simplistic men. The signs above the heads of the men at the post office seem anachronistic, as the picture appears far too old to feature national advertising. Still the advertisements in many ways fit perfectly with the simple appearance of the men. What could possibly be on their minds besides another plug of tobacco for their surely corn cob pipes or a new feed for their beloved hogs. The position of the men also reflects national biases toward the mountain culture; the relaxed, comfortable position of the two men on the right implies a laziness and lack of ambition commonly associated with the mountain folk. 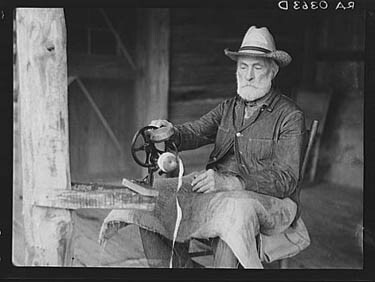 The photograph of Russ Nicholson at work with his apple peeler illustrates a similarly relaxed manner. Even at work, Nicholson is tilted back in his chair, calmly and seemingly lacksadaisically completing his task. The antiquity of his apple peeler, too, can not help but be noted nor can the rough assembly of the log cabin at which he works. His rugged beard and old-fashioned dress complete an image Americans can only expect to see when thinking of mountain folk. You see this man in his environment and by studying the picture a little bit you get to learn a great deal about the kind of complex personality that he is. 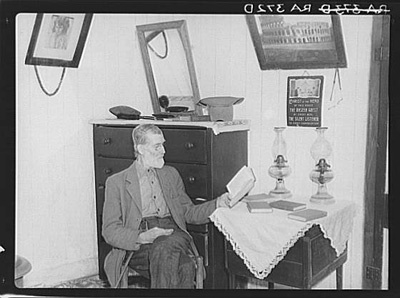 He's not just an ordinary hillbilly postmaster--he's a man who reads books as you can see by the fact there are several books on the table as well as the one he has in his hand. He also is a religious man.... He obviously is a man that knows how to have fun. And this man who seems to be a small town postmaster is really a complex person and you learn all that from studying this picture (qtd. in Johnson 17). Home of Postmaster Brown, Arthur Rothstein, Shenandoah National Park, Virginia. Despite the power of Rothstein's picture and his description, it is not the image of Brown that dominates the Shenandoah Valley collection. Instead, it is the image upon image of the primitive hillbillies, the beaten and downtrodden mountaineers in dire need of help, that fits most snugly with the FSA's mission and that comes most clearly--and most identifiably--to represent the denizens of the Blue Ridge Mountains.